When I first start­ed pho­tog­ra­phy at 12 years old I learned three rules that every good pho­to­graph has in com­mon. Three rules to use as a guide­line in your pho­tog­ra­phy. Next time you take a pic­ture, think about these three points. 1. What is my sub­ject? 2. How can I Focus Atten­tion on the Sub­ject? 3. How can I Sim­pli­fy this Pic­ture? What is your sub­ject? Every good pho­to­graph has a defined sub­ject. Some per­son or object your pic­ture is about. This should be clear when some­one looks at your pic­ture. Hav­ing lots of extra­ne­ous things in your pic­ture will dis­tract from your sub­ject. Include those things that con­tribute to your theme or focus atten­tion on your sub­ject; remove those things that detract from it. Try to get rid of any­thing that doesn’t con­tribute to your pho­to­graph. Move around, change your angle, get clos­er, get rid of clut­ter, any­thing you can do to remove those things that don’t con­tribute to your pic­ture. Every­thing inside your frame should add some­thing com­pli­ment­ing the sub­ject or the theme that you as a pho­tog­ra­ph­er are work­ing to con­vey. Any great pic­ture will also have a Theme or sto­ry; it will con­vey some­thing to the view­er. This could be seen as an exten­sion of the first rule or per­haps a sum­ma­tion of the three. This is some­thing will take more prac­tice to achieve but must have these first rules as a sol­id base. When the view­er looks at this pic­ture what do I want them to look at? Is it a per­son? A beau­ti­ful land­scape? A build­ing? What is my pho­tog­ra­phy about? 2. How can I Focus Attention on the Subject? Can I do any­thing to direct the viewer’s atten­tion on my sub­ject? Per­haps there are con­verg­ing lines or a frame that can draw the view­ers eye in. This will take some prac­tice and there are many rules of com­po­si­tion and light­ing that can help you achieve this. But the first step is to start think­ing about it. Just keep­ing this in mind you will start see­ing your scene dif­fer­ent­ly. 3. How can I Simplify this Picture? Are there any things I can remove that will dis­tract the view­er? Can I move clos­er to the sub­ject to elim­i­nate a messy back­ground? Can I try a dif­fer­ent angle that will elim­i­nate some­thing that dis­tracts? Are there any objects that I can include that will con­tribute to the sub­ject or sto­ry of the pic­ture? Some tool in a person’s hand? A prop or oth­er object that helps tell the sto­ry? These are the rules to keep in mind when you are shoot­ing. In the real world, you can­not always get rid of things that are dis­tract­ing or don’t give some­thing to the pho­to­graph. So don’t miss an oppor­tu­ni­ty because it isn’t per­fect. Keep shoot­ing. Keep try­ing dif­fer­ent things. Dig­i­tal film is pret­ty cheap these days right? 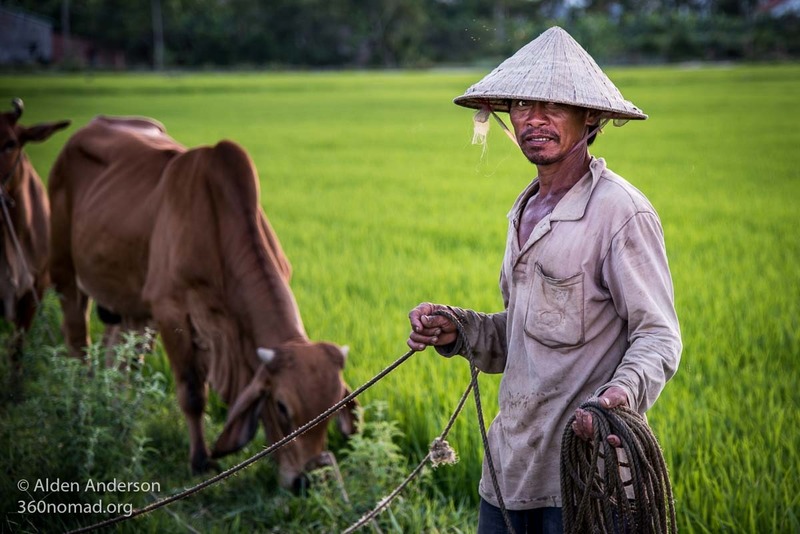 Let us quick­ly ana­lyze a pic­ture of a Viet­namese Cow­boy. 1. Sub­ject. I think it is pret­ty clear that the sub­ject is this man tend­ing to his cows. A defined sub­ject. 2. Focus atten­tion on the Sub­ject. The sub­ject is the only thing in sharp focus, help­ing to focus atten­tion on him. He is also placed to the side of the frame in a more bal­anced and com­po­si­tion­al­ly pleas­ing arrange­ment. 3. Sim­pli­fy -Add help­ful, or sub­tract extra­ne­ous ele­ments. Look at the cows, do they con­tribute to the sto­ry of this man? I feel they do. Click on the pic­ture to enlarge it and try this: cov­er the cows with your hand and look at the pic­ture of this man. What does it tell you? Now remove your hand and look at the pic­ture again. Is it any bet­ter? Does it tell a dif­fer­ent sto­ry? The rope in his hands, an old worn rope. Does this con­tribute or dis­tract? Enlarge the pic­ture again, this time use two hands to cov­er the cows and the rope, so you are now look­ing at just the man’s face and chest. Now, who is this man? Is he a Viet Cow­boy? Or is he just a Viet man? A farmer? What is his sto­ry? Now take your hands away and ask your­self these ques­tions again.